2-1/4" Gold First Place Medal, Silver Second Place Medal, Bronze Third Place Medal. All come with CUSTOM matching 1st, 2nd, 3rd place red, white and blue ribbon only available through All Quality. All other sellers are not selling our custom ribbons. 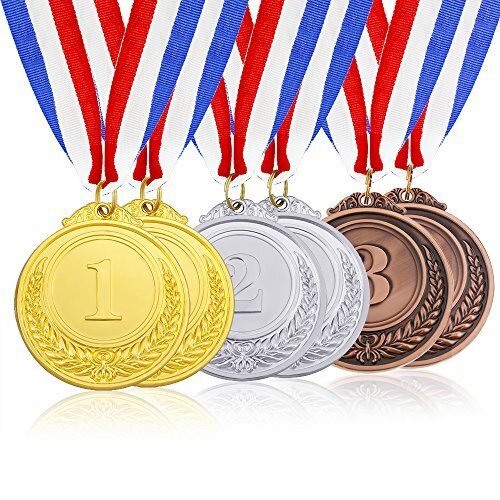 Juvale's official-looking, Olympic-style gold medals are perfect for a variety of competitive events. 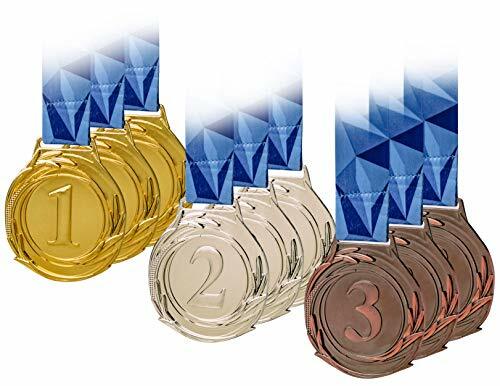 Featuring zinc alloy medals stringed on a red, white, and blue neck ribbons, these award medals are the perfect accessory befitting the chests of proud winners. Each medal is intricately designed with flower borders and '1st' embossed in the center. 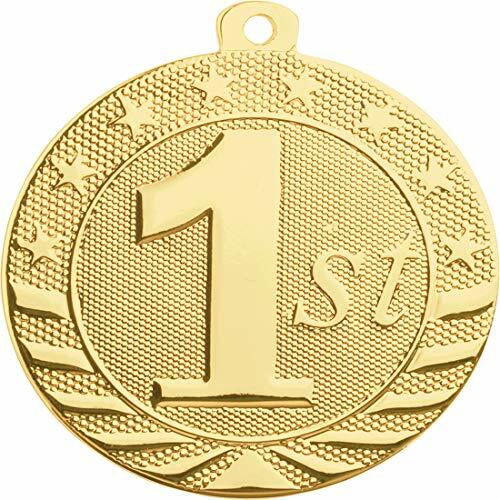 Make this your award of choice for party games, spelling bees, talent shows, relay races, animal shows, festivals, and even chili cook-offs! There is nothing like a gold medal to reward the winner of your next friendly competition. 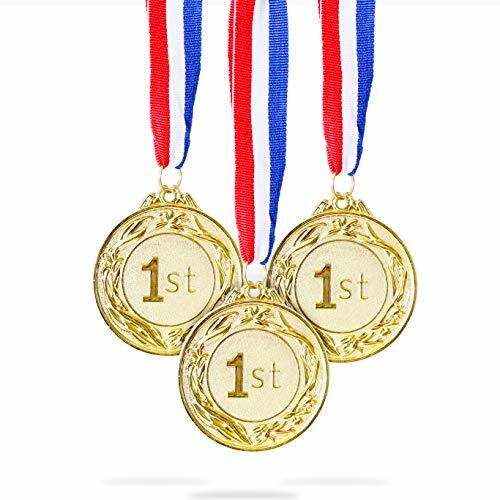 Use our 1st place medals for awards and prizes or host your own Olympic game night! Included: Each order includes three gold, three silver, and three bronze medals. Size: Each medal is is about 1.6 inches in diameter. They have a very impressive look and feel! Don't be fooled by fake medals made or cheap metals! 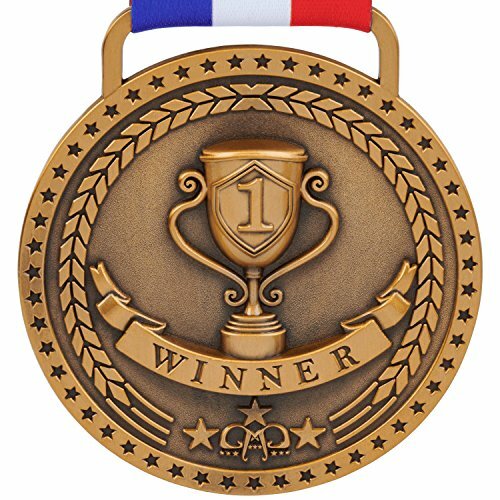 Our winner medals are the best on the market! Quality: Our medals are made of high quality metal, not plastic like many of our competitors. 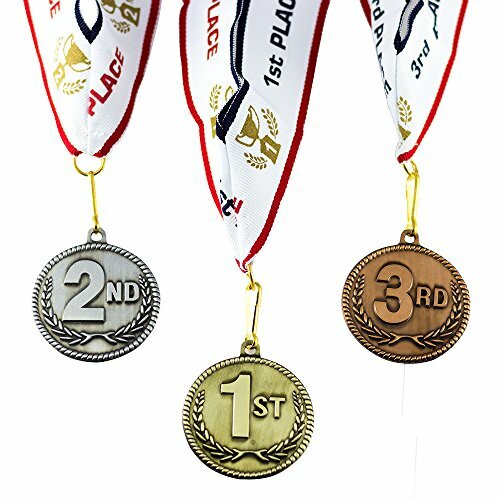 These participation race medallas come with high quality neck ribbons and are sized in a bulk pack of 9 to award first, second, and third place finishers. 2" Gold First Place Medal, Silver Second Place Medal, Bronze Third Place Medal. All come with matching 1st, 2nd, 3rd place red, white and blue ribbon. Ribbon is custom designed. Only sold by All Quality. 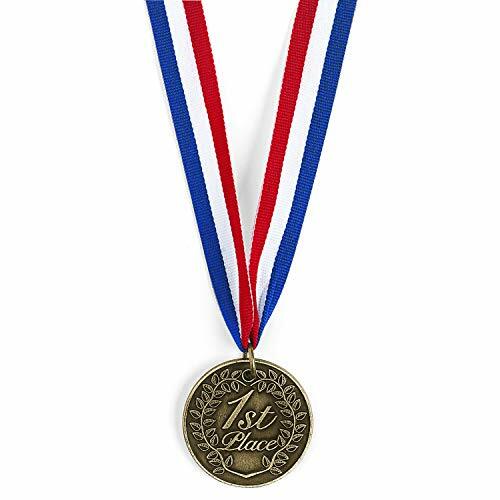 10 Pack of 2" Diameter Die-Stamped Solid Metal 1st First Place Medals and Red White and Blue Neck ribbons. 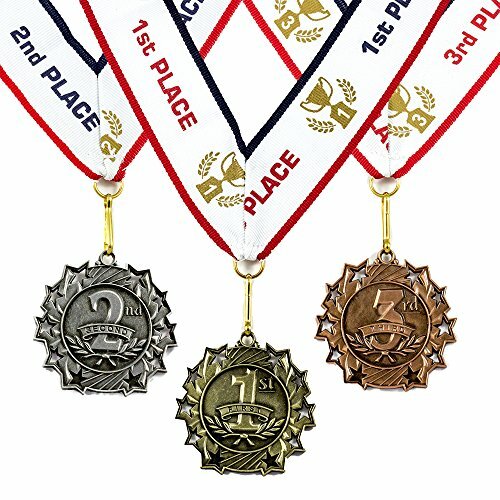 IN-39/2191 1st, 2nd & 3rd Place Award Medals Per Dozen by Fun ExpressHold your own olympics event, academic or otherwise, and reward the winners of each event with these dazzling medals. Includes 4 of each place. These also make great classroom rewards for great work. Each 1 1/4" plastic medal comes on a 28" red, white and blue nylon ribbon. 2-1/4" Gold First Place Medal, Silver Second Place Medal, Bronze Third Place Medal. All come with matching 1st, 2nd, 3rd place red, white and blue ribbon.